Emerson Square is a mixed-income community in Evanston, Illinois that was funded with support from the Regional Housing Initiative. 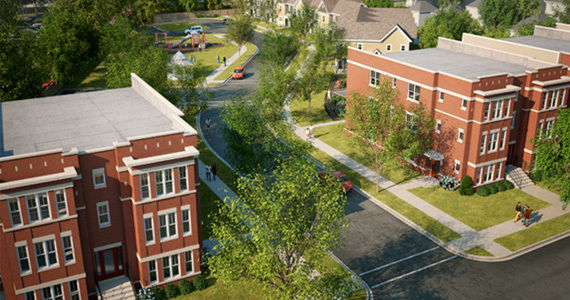 The project features a variety of housing types within walking distance of downtown. Image courtesy of Brinshore Development, LLC. In February, leaders throughout the public and private sectors gathered in Denver for the “New Partners for Smart Growth: Building Safe, Healthy, Equitable, and Prosperous Communities” conference. The event brought together practitioners and policymakers to share ideas, lessons, and the success stories that are helping to support sustainable, equitable development in communities across the country. HUD is a key partner in projects and plans that advance these smart growth efforts and supports smart growth through the development of regional plans and neighborhood revitalization strategies. As part of a conference session devoted to advancing regional equity, HUD leaders joined metropolitan planners and housing experts to discuss promising regional collaboration efforts to expand housing choices in high-opportunity neighborhoods. In 1999, leaders throughout metropolitan Chicago, including municipal mayors, employers, housing advocates, and regional planners, recognized that the region’s growing imbalance between jobs and affordable housing threatened its economic competitiveness. The number of affordable, workforce apartments being developed in Chicago’s suburbs had not kept pace with job growth, making life difficult for both members of the workforce in need of affordable housing and the area businesses that employ them. Chicago-area mayors responded with the Housing Action Agenda and its supporting Housing Endorsement Criteria and by thinking creatively about how to use federal housing assistance to address regional workforce housing needs. The framework established support for housing investments near employment centers and encouraged collaborations among mayors, public housing agency (PHA) officials, policymakers, planners, and other stakeholders to address local barriers to affordable housing production and challenges to household mobility. Antonio Riley, HUD’s Midwest regional administrator, described the Chicago Regional Housing Choice Initiative (CRHCI), a HUD-funded, three-year pilot project that evolved from the collaborative efforts in the region. The demonstration, launched in 2011, encourages families to use tenant- and project-based housing choice vouchers (HCV) to access housing in quality neighborhoods. The pilot aims to show if mobility counseling and the regional administration of local PHA resources can give families desirable location outcomes while reducing government costs and administrative burdens. Of particular importance to advancing regional equity through expanded housing choice, CRHCI is helping to spur the construction of mixed-income apartments in smart growth areas by building on and refining the successful Regional Housing Initiative (RHI). RHI is the project-based component of the CRHCI pilot; the funding from HUD is helping to further improve the administration and outcomes related to the existing program. Since 2002, RHI has helped construct, rehabilitate, and preserve affordable housing units by pooling a small number of project-based vouchers from participating PHAs (currently 8 PHAs participate) and allocating them to developers through a competitive application process. The vouchers, which are often matched with low-income housing tax credits from the Illinois Housing Development Authority, act as an operating subsidy for developers to finance mixed-income apartments in the participating jurisdictions. The regional Metropolitan Planning Council works with local PHAs to award the vouchers to government-supported development projects. Riley noted the program’s successes to date — 345 RHI project-based voucher subsidies in 28 developments amounting to more than 1,700 apartments completed or in development — and underscored how the pool of regional vouchers allowed smaller PHAs to support developments that would not otherwise be financially viable. To simplify the administration of the CRHCI demonstration program and its efficacy for PHAs and developers, the program maintains a single, regional waiting list of families seeking to move to RHI-funded developments. HUD also funds mobility counseling for families interested in moving to RHI-funded developments. CRHCI is supported by other work to expand housing choice in the metropolitan Chicago region. Through its Sustainable Communities Regional Planning Grant, the Chicago Metropolitan Area Planning Council prepared a Fair Housing Equity Assessment for the region. Completed by all Sustainable Communities Regional Planning grantees, the assessment provides a framework for understanding and advancing fair housing at the regional level. CRHCI has incorporated HUD data into “opportunity index” maps based on housing stability, job access, and transit access to assess neighborhood quality at the census tract level. The information detailed in the maps is helping to site RHI-funded projects in these high-opportunity areas. Chicago regional efforts to align housing choice and equity with smart growth have been forged through local leaders’ recognition of the importance of affordable housing to economic development, and PHAs’ recognition that regional collaboration can facilitate place-based investments in areas of opportunity. CRHCI illustrates how communities can expand housing opportunities while advancing regional equity.